The Mooni products combines thoughtful Scandinavian design with innovation. 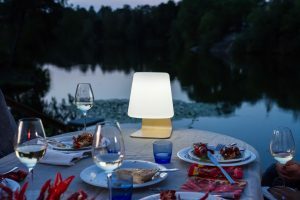 The new manufactured lifestyle lamps also combines illumination with integrated loudspeakers. The standard product range with possibilities for bespoken solutions fit perfect in maritime environment and suit the requirement of the superyacht designers. The available lantern and table lamps with speakers have an elegant Pinewood or rubber handle. Lantern and lamps are delivered with warmwhite color or RGB colors with 5 different program modes and 9 colors. The speaker versions products are controlled integrated Bluetooth 4.2 versions. Rechargable batteries with USB for all products last between 4 to 10 hours usage.